Still haven’t thought of a good New Year’s resolution for 2017? 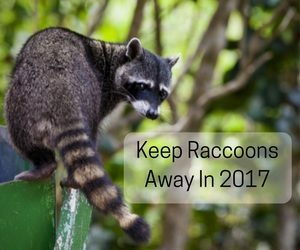 Keeping your home raccoon-free is a great place to start! These critters have become dependent on rifling through our garbage cans for food, which brings them way too close to our homes and families. We always recommend calling on professional assistance when dealing with a raccoon problem, but there are things you can do to help keep the furry bandits at a safe distance. Raccoons are primarily attracted to homes for their easily accessible food and water sources. Make your property uninteresting to them by securing garbage cans with tight-fitting lids, and bringing any pet food or water dishes inside. For extra security you can place something heavy like a large rock on top of your cans as an added deterrent. Make sure all garden hoses are turned off and leak free. These critters rely on their ability to hide in the shadows, and are most active in the evenings or at night. A simple motion-activated spotlight or porch light left on at night goes a long way towards discouraging their activity. Even though raccoons are daring enough to dig through our garbage cans, they still have a natural fear of humans. Put a small, weather-resistant radio out near your trash cans with a talk radio station playing to scare them off. If your raccoon problems persist after giving our tips a try, don’t hesitate to call for help. Our technicians are able to remove wild animals safely and effectively while keeping you and your family out of harm’s way. Call us at 817-222-1101 to schedule your free home consultation today!